When you borrow money to buy a car—or if you lease a car—you don't own the vehicle "free and clear." You get to drive it, but the car can be taken away through repossession if you stop making payments. Before you get to that point, learn how the process works, what the issues are, and what you can do about it. In repossession, a bank or leasing company takes a vehicle away from the borrower, often without any warning. 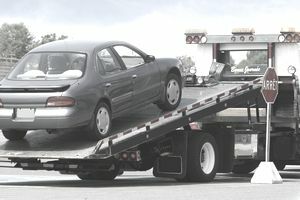 Lenders might send a driver to collect the car, or they may take it away with a tow truck. In some cases, your car will be disabled by remote control so you can’t drive it until you’ve cleared things up. When is repossession allowed? To borrow money or lease a car, you have to agree to specific terms. For example, you agree to make payments on time and keep adequate insurance on the vehicle. If you don’t meet those requirements, the bank (or leasing company) has the right to take the car. Resulting problems: In addition to losing the car, your credit will suffer, and you’ll probably owe significant fees. Repossession, whether you eventually get the car back or not, shows up on your credit reports for seven years and can lead to lower credit scores. We’ll discuss those problems in more detail below. Your lender might have the right to take your car, but you also have rights. The details vary from state to state and lender to lender, so be sure to read your agreements carefully and check with local consumer advocates. If you or your family are in the military, additional rules might apply. Private property: Lenders can repossess a vehicle that is parked on private property, but state laws generally restrict them from "breaching the peace" while doing so. For example, repossession agents cannot damage property to get to your vehicle. They typically cannot destroy locks to get into your garage, nor can they use or threaten to use physical force when taking your car. Sales price: If your car is taken and sold, the lender needs to sell it for a "commercially reasonable" price. It doesn't need to be the best price, but the lender must make an effort to get fair market value out of the car. Why? The sales proceeds will go towards paying off your debt, so it would be unfair to repossess the vehicle and "give it away" to somebody else. Speak with a local attorney if a repossession results in your rights being violated. You might have the right to take legal action against your lender (making them pay for damaged property, for example), and your lender might lose the ability to collect deficiency funds from you. Things don't necessarily end after repossession. If your lender sells your car, the sales proceeds go toward your loan balance. In many cases, the car sells for less than you owe, so your loan is still not paid off. The amount you owe after the vehicle sells is called a deficiency. Added costs: In addition to your loan balance, you also have to pay for costs related to repossession. Charges can include expenses for sending a repossession agent, storing the vehicle, preparing the vehicle for sale, and more. Those costs are all added to your deficiency balance. If you can’t pay the balance, expect your lender to send your account to a collection agency. At that point, you can negotiate a settlement, pay nothing, or set up a repayment plan. In some cases, your debt will be forgiven or charged-off (possibly resulting in tax liability for forgiven debt). If you want to stop the repossession process and keep your car, there are several routes available (depending on your state and the terms of your agreement). Your lender or leasing company should explain what your options are, as well as the requirements and deadlines for each option. Reinstate: Want to hit the "Reset" button? One option is to pay all of your past-due payments and repossession costs, which will get your loan reinstated. You’ll get the car back, and you’ll be back in roughly the same position you were in before repossession (although your credit will still show the default). As long as you continue to meet the terms of your contract going forward, the car is yours. Redeem: To put everything behind you, redemption might be an appealing option. This involves paying off the loan entirely (all of the past-due payments, plus the remaining loan balance) and covering all of the repossession-related costs. In other words, you just buy the car and pay the legal fees. This is not easy for most people—if you had the money you would have made payments—but it might make sense if you’ve customized the vehicle or made significant upgrades. Bankruptcy: If you file for bankruptcy, you might stop the repossession process—at least temporarily. Your filing triggers an "automatic stay" that stops collection efforts by your creditors. However, the process is complex, and repossession is still possible with approval from a judge. Check with a local attorney before you stop making payments or rely on protection from bankruptcy. Bid at auction: Lenders might sell your car through a private sale or public auction. The lender should inform you about what happens to the vehicle after repossession. If the car will go to auction, you can try to attend and bid on the car. If you win, you’ll take possession and you won’t need to keep making payments, but you still might owe a deficiency balance. You probably won’t know exactly when a repossession agent is coming for your car. You might simply walk outside and find that the vehicle is missing. If the timing is a surprise, there’s a good chance that some of your belongings will be in the car (a set of tools in the trunk or clothing in the back seat, for example). Since those items were not part of the original contract, your lender is not entitled to keep them. After repossession, you should be notified of how to claim your belongings. But act fast—you might only have 30 days or so. What about aftermarket parts and upgrades? The devil is always in the details (so read the fine print and check with a local attorney), but it’s probably safe to assume that anything attached to the vehicle will not be returned to you. If you have valuable wheels, suspension, and audio equipment, replace those items with stock parts before your car is repossessed. Can you Return Your Car If Payments Are Too High? If you don't pay the mortgage can lenders come after you? How Do You Sell a Car You Still Owe Money On? What Does it Mean When You Default?